From Steve Ballard, who was doing his best Curt Cavin impersonation for the IndyStar this weekend. Terry Angstadt, president of the Indy Racing League's commercial division, said his upcoming trip to China and ongoing talks with Brazil don't mean the IndyCar Series is intent on going global. "We're a domestic series and will continue to be," he said Sunday. "But to not explore opportunities in countries with emerging economies, we would not be doing our job." Angstadt leaves Sunday on a five-day junket to China. Any race there is at least two years away, he said, but Brazil is a likely addition to the 2010 schedule. It's important to note that "likely" is Ballard's word and not Angstadt's, but that doesn't mean this is pure fiction. It does, however, mean that we have to look at this picture - taken in Brazil - because you might recognize some of these young men. Whether this is a good idea or not depends on the details, principally whether it will be a good race (Is the track wider than my desk? Can IndyCars overtake in more than half a spot on the track?) and when it is. Also, how much money IndyCar will make off it. If the Brazilians want to give the league 19 bazillion to come down there, well, business is business. Given the switch to Apex this year I'm thinking the money's there. Would they use the same track as what F1 uses while in Brazil? From what I remember it's a great track, but not wide enough, and with some awesome up and down hill action. I see no reason not to grow the market in this hemisphere, but have no interest in a china race--then again if either of those locations could extend the season and keep the current line up of tracks stable I'm ok. I want MIS and Cleveland back on the schedule, but I won't hold my breathe on either. 1.) It's in our general time zone. 2.) It might actually be entertaining. 3.) It would likely draw a big crowd. 4.) A bunch of Indycar drivers are from there, and several former greats, too. 5.) It might annoy Bernie. Also, I think the idea of a secondary season during the winter makes more sense if it's in South America. A three race swing through Brasilia, Sao Paolo, and Argentina would make a fun winter diversion. Is it just me or does the guy (I'm assuming that's TK) in front look like Marco? I'm not assuming they'd use the same track, but it's still a good clip. Is it a given that it's going to be a road course? 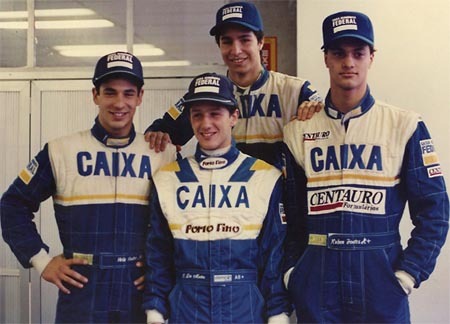 They have (or had) an oval (tri oval) in Rio that CART raced at for a few years. Greg Moore won there...that's where Mark Blundell had that "piss-your-pants scary crash" when his brakes failed. It's conducive to good racing...but I don't know if it's fallen into disrepair or not. I was wondering if they had a decent oval. That "oval" CART used to race at is gone. At least the oval parts are. I think some of it is still a road course. Is the oval called Curtiba, or something like that. In the pc racing game Race 07, wich follows the Fia world touring cars, as well as f300, Curtiba is a track in Brazil. it has an oval like feature, but looks diffrent, google race 07 and go to the website to see more. Also, if they are going to China, please go to Macao instead. The street course there is insane, again, go to race 07 to see more. I know it is just a game, but all of the tracks, execpt one, are all real ones, and also include Puebla,Mexico, which the IRL may race on. I think, left to right, are Helio, then in the back is Bruno, in front of Bruno is Cristiano DaMatta, and I have no idea about the one on the right. You should make a contest of this, you know. I'm really not sure where they could possibly race there, apart from Interlagos (the F1 track). It's the only facility in the entire country that I can think of that would be even remotely capable of holding an IndyCar race. The ovals at Curtiba and Rio, though they're laid out well, are obviously out of repair, and all the other road courses in the country are almost too narrow for touring car races. I second that. That is all.